The RMX Series amplifiers give you clean, dynamic power with the legendary QSC sound quality and reliability that pros depend on. The RMX Series deliver unmatched performance at a new breakthrough price. The power supply is the heart of an amplifier, converting raw AC power from the wall to clean DC for the audio circuitry. The RMX uses a powerful high-current toroidal transformer and ample filter capacitance to ensure generous energy reserves. This makes a critical difference in sound quality, allowing the amp to effortlessly punch out high level transients, even when driving abusive 2-ohm speaker loads. RMX amplifiers deliver true studio-quality sound. A full complementary output circuit using the highest-grade linear output devices delivers ultra-low distortion ( <0.05% THD) & a ruler-flat frequency response. SMT (Surface Mount Technology) triples small-signal component density, enabling us to pack up to 2400 watts of power in a chassis only 2 rack spaces & less than 16" deep. And unlike other designs, RMX output devices are direct-mounted to the heat sink for optimum thermal coupling & cooling. Independent defeatable clip limiters reduce distortion without sacrificing peak performance. Selectable low-frequency filters boost system response, protect speakers and ensure low-end tightness by more precisely matching the amplifier's range to the loudspeakers. Barrier strip, XLR and 1/4" balanced inputs plus Speakon and binding post outputs provide easy connections. Low-noise variable speed fans with rear-to-front air flow keep amplifiers and racks cool. 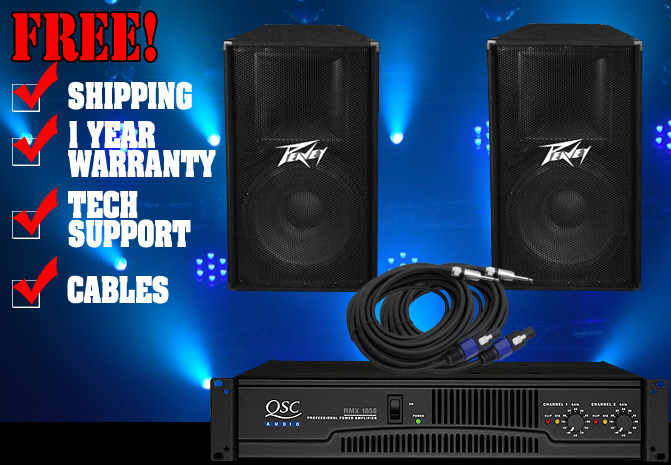 With over 30 years of building amplifiers for the largest touring companies and venues around the world, you can count on QSC's reputation for designing the most reliable amps available.